Starring Paul Giamatti, Bradley Cooper and now the much more widely known Zach Galifianakis, Ed Helms. TMG will make this easy for you. Skip this movie. Go back and see Hangover I from 2009. You can read our commentary on that film. They just took a very funny 8.0 rated film and duplicated it and deleted most of the comedy. No originality. No new story. All the same folks. Same set up. Tyson shows up at the end. It is all only moderately funny. 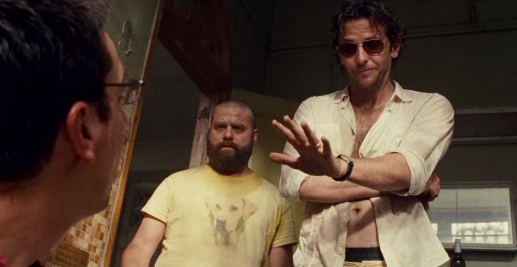 The original Hangover perhaps earned its over $450 million dollar worldwide take to date. But this sequel has already ripped off everyone to the tune of $137 million over the 2011 Memorial Day Weekend. It takes everyone getting back to work I guess for word to get around how terribly mediocre to lousy it was. Ten minutes in..I counted…not one single laugh line. The first good laugh came at 30 minutes in. This is not good for a comedy. The line is not even delivered by a principal actor but by Stu’s (Helms) bride to be Asian father who deadpan toasts comparing Stu to his disabled brother living in a group home. Alan (Galifianakis) delivered the only truly funny line of the movie when describing a an albino polar bear. “It was black.” I really laughed. About all I got out of this film were the cool luminarious they lit near the end at the wedding. Pretty cool. I cannot wait to try it. You can wait forever on this film. It sure felt like I did. Bridesmaids is still out in theatres as of June 1. So is Everything Must Go and Something Borrowed. But if you really want a bad hangover….by all means go!